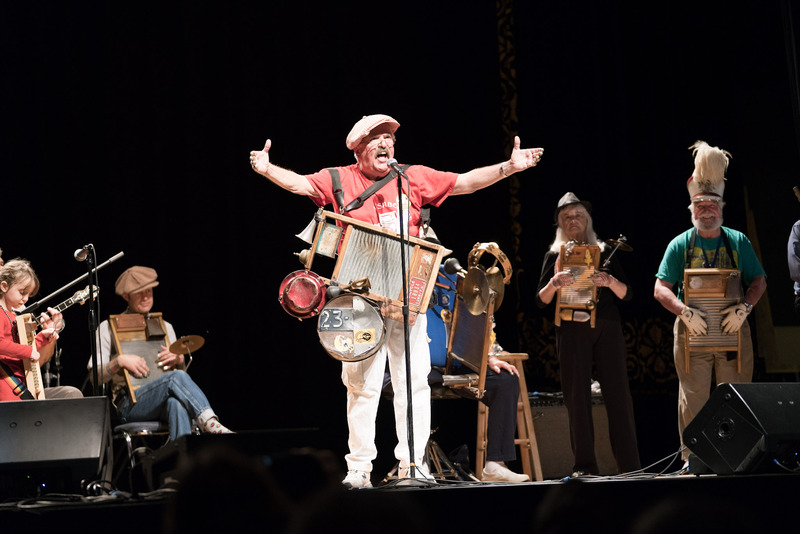 Jazz Bash by the Bay presents the 18th Annual Monterey Washboard Concert, affectionately dubbed Washboard Spasm by Gary Ryan. These concerts were conceived by Washboard player Bill Gunter and first presented at the Sacramento Jubilee in 1983. Annually organized by Mike Johnson and MC’d by” Little Peetie” Babcock, the spasm is a great way to start your day with some foot stomping, toe tapping, hand clapping good old fashioned fun! Four hardworking musicians (Chris “Mr. Excitement” Calabrese, Fast Eddie” Erickson, “Goofy” Gary Ryan and Sam Rocha) will bravely accompany an entire stage full of assorted washboardists, each one equipped with an array of toys and noise makers. And, oh yeah, one washtub bass. Don’t miss your chance to get loose, singalong, clap along or just soak up the fun. Only one chance to catch this amazing event: Saturday at high noon in the Serra II room.